Meadow Saffron is not easily confused with other wild plants on this web site. 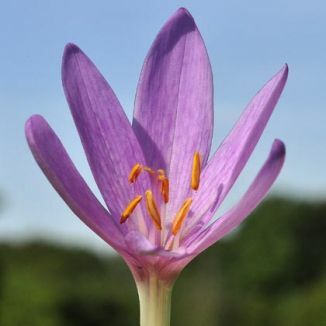 Appearing as a sea of rich pink in wet meadows and fields, Meadow Saffron is one plant, the beauty and wonder of which can only be hinted at by photographs. Each pink-purple flower (4 cm across) has six 4cm-long lobes and in the centre of these are six stamens bearing orange anthers. These flowers are held solitarily on weak, white, tubular stalks (which are in fact extensions of the perianth). Bulbous perennials, they bloom from August to October, the long, ovate, bright-green leaves having preceded them in spring. These leaves die off before the flowers appear. These are rare plants which only grow to about 10cm high, they are natives and belong to the Liliaceae family. 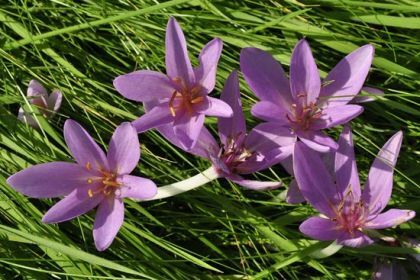 Meadow Saffron is sometimes confused with Autumn Crocus or Crocus nudiflorus but the latter only has three stamens. I found this wildflower near Inistioge, Co Kilkenny in 2009 and photographed it at that time. To see these flowers, individually and as part of a host of colour in a damp meadow, is to feel privileged. It is one of the most beautiful sights I can remember and ranks very close to seeing a Bluebell wood in early May. They remain superb pictures in the mind, long after they have faded themselves. This species is protected under the Flora (Protection) Order, 2015 and is classed as ENDANGERED in the Red Data List of Vascular Plants 2016.